This WLGO event is an four person team scramble format. The registration fee includes a $10 per player donation, green fee, shared cart, warm up bucket, lunch, a WLGO gift bag, local prizes and awards ceremony following play. Monday, August 1. Registration Time: 5:30am. Start Time: 8:00am. $260 Foursome. $130 Twosome. $65 Single. 2775 Ela Road Hoffman Estates, IL 60192. Questions? Call 847.359.5850. Monday, August 1. Registration Time: 7:00am. Start Time: 8:00am. $276 Foursome. $138 Twosome. $69 Single. 355 W Washington Avenue Lake, Bluff, IL 60044. Questions? Call 847.234.6771. Monday, August 1. Registration Time: 12:00pm. Start Time: 1:00pm. $296 Foursome. $148 Twosome. $74 Single. 2411 West Illinois Ave Aurora, IL 60506. Questions? Call 630.907.0500. $199.96 Foursome. $99.98 Twosome. $49.99 Single. 13100 S Halsted Street, Riverdale, IL 60827. Questions? Call 708.849.1731. $236 Foursome. $118 Twosome. $59 Single. 6145 Golf Road Morton, Grove, IL 60053. Questions? Call 847.965.5353. Monday, August 1. Registration Time: 12:30pm. Start Time: 1:30pm. $200 Foursome. $100 Twosome. $50 Single. 16310 S Central Avenue Oak, Oak Forest, IL 20136. 708.429.6886. Monday, August 1. Registration Time: 12:00pm. Start Time: 2:00pm. 12840 Del Webb Boulevard, Huntley, IL 60142. Questions? Call 847.515.7682. Monday, August 1. Registration Time: 1pm. Start Time: 2pm. $280 Foursome. $140 Twosome. $70 Single. 7205 W 115th St, Worth, IL 60482. Questions? Call 708.671.1032. Monday, August 1. Registration Time: 12pm. Start Time: 2pm. $240 Foursome. $120 Twosome. $60 Single. 6401 S. Richards Drive, Chicago, IL 60649. Questions? Call 773.667.0524. Monday, August 1. Registration Time: 2pm. Start Time: 3pm. $160 Foursome. $80 Twosome. $40 Single. 11599 W. 31st St, Hinsdale, IL 60523. Questions? Call 708.562.2977. Tuesday, August 2. Registration Time: 6:00am & 1:00pm. Start Time: 7am & 2pm. $ 236 Foursome. $118 Twosome. $59 Single. 8600 W Forest Preserve Avenue, Chicago, IL 60634. Questions? Call 773.625.9630. Monday, August 1. Registration Time: 9:00am. Start Time: 11am. $120 Foursome. $60 Twosome. $30 Single. 1005 S. Centennial Dr., Munster, IN 46321. Questions? Call 219.836.6931. 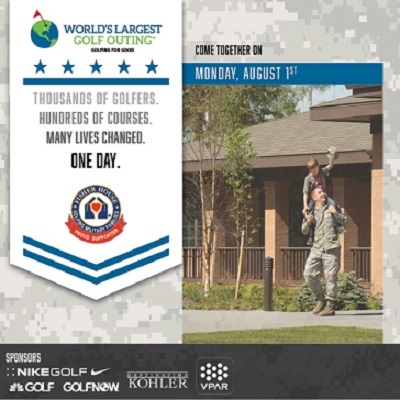 Learn more about World's Largest Golf Outing and Fisher House Foundation.